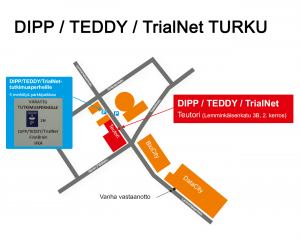 The DIPP/TEDDY/TrialNet Clinic is located in Turku Science Park in Toutori (see enlarged part of the map below), Lemminkäisenkatu 3 B, entrance B, 2nd floor. 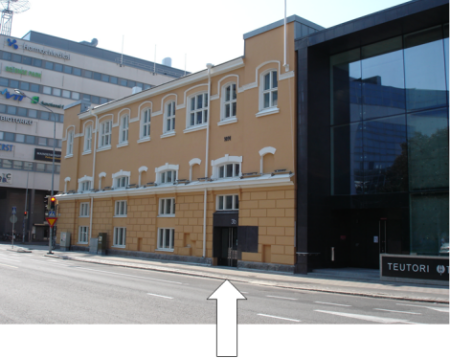 The location of the clinic in Turku guide map. In case your policlinic time is not suitable for you, we kindly ask you contact your research nurse. Buses 32, 42, 110, 192, 19 and 320 drive from Turku city-centre to Science Park. The buses start from the Market square. Buses 32 and 42 drive to Science Park also from the main railway station.